Reliance Foundry's decorative bollards offer an elegant figure on building perimeters, and ensure building and pedestrian safety. Editor’s note: Reliance Foundry counts the public sector as one of its biggest market segments. Jeremy Bradley, the firm’s marketing manager, tells GPN: “Reliance Foundry absolutely sell to cities and counties — they’re some our biggest clients!” The company provided the content below. As part of its 90-year history, Reliance Foundry has been manufacturing a range of bollards for both utility and high-end building design. The R-7539 Decorative Bollard is the company’s signature bollard. It offers an elegant, shapely figure—designed to improve aesthetics for high-profile building and landscape perimeters. According to the Storefront Safety Council, motor vehicles collide with commercial buildings as many as 20,000 times—causing 4,000 serious injuries and 500 deaths—per year in Canada and the United States. Pedestrians are especially vulnerable—especially when sidewalks and storefront entrances are unprotected. People are also at risk inside buildings, as most vehicles can easily penetrate windows—and even most exterior walls. Safety bollards are one way to preventing collisions with buildings and people. Impact-resistant bollards are made from structural-grade steel embedded deep in concrete to withstand heavy-duty collisions. On their own, impact-resistant bollards may not suit the aesthetics of surrounding buildings and landscapes, however. High-profile buildings in particular require more attention to aesthetics, and well-selected design elements can enhance user perception of a building and location. R-7539 Decorative Bollards (photo at left) are made from cast ductile iron and are powder coated for resilience and dependability. Cast metal designs offer good detail and form that would otherwise be cost-intensive to machine. Powder coatings provide good durability and texture—and can be customized to any color. 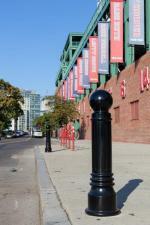 Decorative bollards can be installed with a selection of mounting and anchoring options. They can be installed as standalone decorative features or to cover impact-resistant posts. Architects, designers and facility managers can select from embedded anchors for new concrete installations or drilled anchors for existing concrete surfaces. Decorative bollards can also be installed with removable mountings. They are ideal for service entrances and multi-purpose spaces. Removable bollards are pinned to a standard mounting bracket affixed with drilled anchors. Brackets can easily be removed to avoid tripping hazards. Retractable mounting columns can also be embedded in new concrete. Retractable mounting columns retract flush with concrete surfaces to prevent obstruction when bollards are removed. 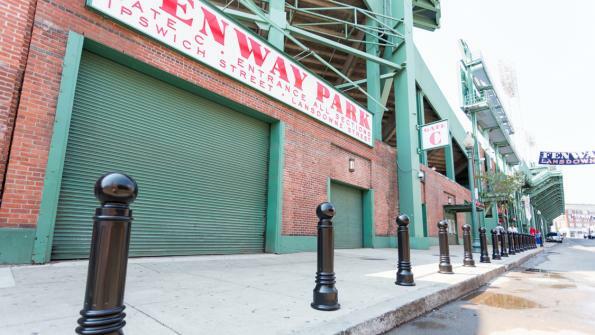 R-7539 Decorative bollards have been installed at many iconic locations in North America—including Boston’s historic Fenway Park. Go here to view a video of them being installed at the home of the Bosox.